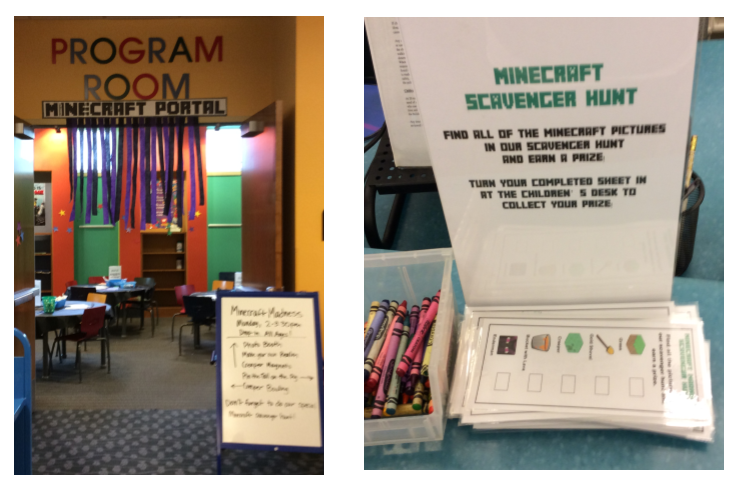 The one program I knew I wanted to do over Spring Break was something Minecraft-related. We do have 10 public computers in my children's department but I knew that wouldn't be enough to meet demand so I decided to plan an "unplugged" program. I was fortunate to find tons of awesome ideas online and I actually think I have enough ideas that I didn't use this time around for another program. Maybe this summer? 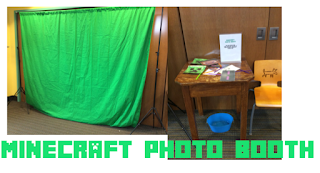 Our program was a drop-in, all ages program held the Monday of Spring Break from 2-3:30pm. We had 95 people attend and I received some really kind compliments. To decorate the room, I used black tablecloths. 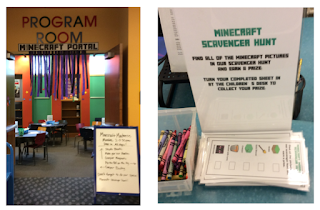 I also hung purple and black streamers and a Minecraft portal sign in front of our program room door. We had two crafts, both from Kerry Ann Morgan's AWESOME blog post. What I loved about these crafts was their simplicity. We did the Minecraft creeper magnets and the Minecraft sticker crafting project. I overheard one of the boys say, "This is the simplest magnet I've ever made and (dramatic pause) THE BEST!" 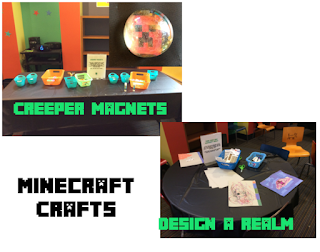 The design your own realm craft required the sticker printouts, construction paper, scissors, and markers. The creeper magnets required glass tiles from Dollar Tree, glue sticks, magnets, and the creeper face printouts. We also had three games to play. I made 6 creepers out of dry floral squares from our local Dollar Tree store. I left them all in their plastic. 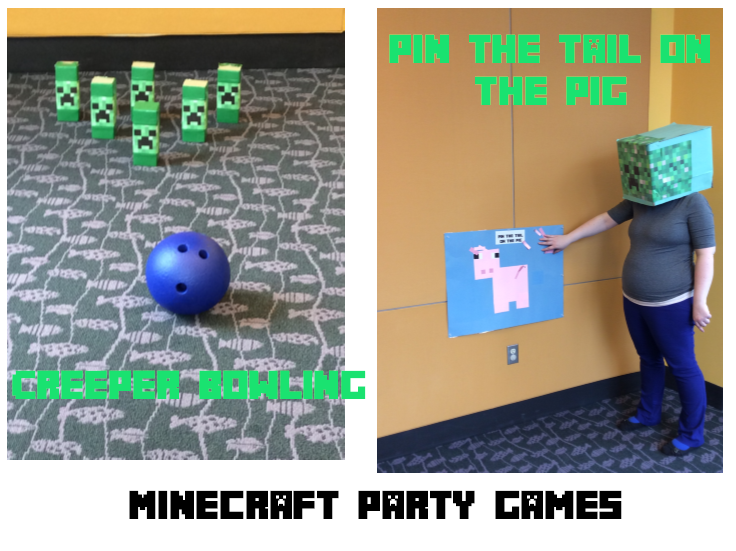 Then I printed off a Creeper face image and duct taped it to the front of each square. Then I covered the remainder of the square with the same green duct tape (which we already had, score!). They turned out pretty cool and this seemed like the sturdiest way of doing it. This game was inspired by the Knock It Down Creeper game from this blog, but I made it a bowling game instead of a bow and arrow game. I also made a Pin the Tail on the Pig Game. I made a Creeper helmet for the kids to wear instead of a blindfold (faster! 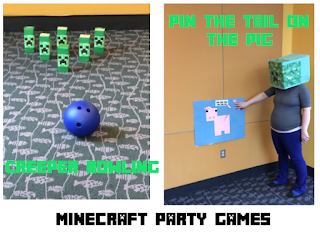 ).One of my coworkers made a Minecraft scavenger hunt so we had that out during the program as well. Last but not least, I set up the library's portable green screen set up for a photo booth. I printed off these masks, laminated them, and attached them to drinking straws and let the kids take photos with their own devices.